The action over the past week was decisively bearish. The market continued the downside movement started 2 weeks ago and declined in all 5 trading sessions reaching a 70 points decline in 2 weeks and more than 100 points lower vs. the August and early September peak. Continuing the bearish signs, the market broke decisively below the trend line connecting the last significant lows (the one from February and the one from June). But of course, the real question is: what now? Will the market continue lower or is a bounce in the cards? Looking at the cycles, we can see the same bearish signs: the weekly support level on ES was broken, despite it having higher odds of holding. YM also broke its support, albeit only marginally (shown on chart). The directionality tool did provide a nice warning that the bounce after the initial decline was not going to hold, by continuing to move lower throughout it. It is currently at the minimum value and if a more significant bounce is coming, it will start moving up. We also have a LRE (lower risk entry) for longs on YM and as we can see in the past (highlighted on chart) these have the potential to trigger a big bounce. A 2nd consecutive one triggering next week will definitely be something to watch for. As we were mentioning last week, the daily cycles were bearishly inclined and the market delivered just that. YM was in a confirmed impulse down and it had triggered a 2nd bearish retrace (BR) resistance level which normally needed a 2nd END support lower. The market moved decisively lower, so now we are on the look-out for a support level to trigger. ES also triggered (late) a resistance just above the previous support and then a new support lower, which was slightly broken. Going forward it will be important to see when a support level will trigger on YM. That would be a big warning that the decline is at least pausing for a while. 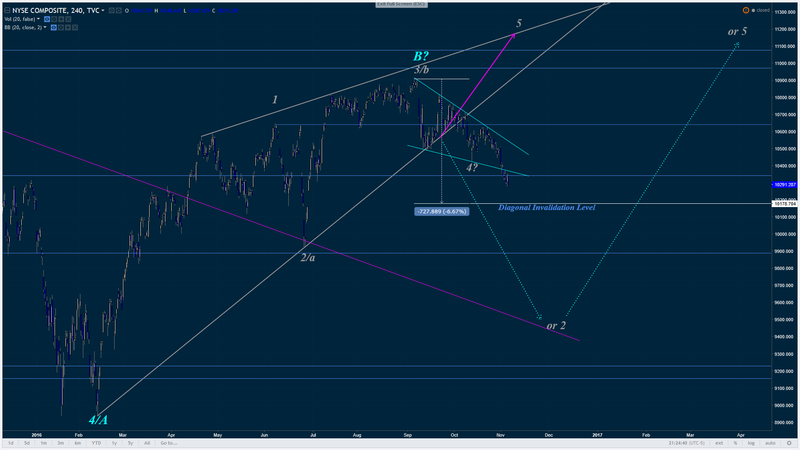 Revisiting our potential Elliott Wave ending diagonal on the NYSE Composite from previous updates, it is very obvious that we've broken the rising wedge pattern and have begun to sell off. 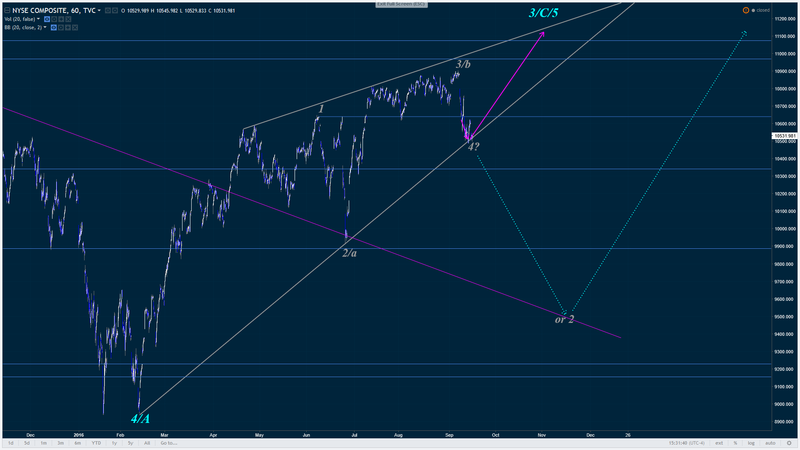 This brings in a demarcation point where the diagonal structure becomes invalid because in a contracting ending diagonal, wave 2 must remain shorter than wave 4. We've marked that level where that is no longer the case and at which point we can begin looking for much lower prices as the next viable structure would bottom in the 9600 to 9500 area. Futures are markedly green at present so a challenge of the upper area of the declining wedging pattern is a relatively good probability at this point. Good luck this week. Happy Halloween weekend everyone. This weeks update is going to take a top down approach in an attempt to ground everything and get a good look at the forest and focus a little less on the individual trees that comprise it. On our run up from the 2009 lows you can see that we've broken from the sustained uptrend at magenta which gave us our first substantial correction since the 2011 lows. The vast majority of analysts are quick to declare a new trend is under way after a rally or decline begins simply as a function of near term price action. This is a mistake. Large trend moves take time to consolidate as expectations change among investors. These periods last just as long as the trend periods if not longer. At present, we are about half way through such a period as we traverse across the blue channel from the upper bound to the lower. Now while the 400 point range from 2200 to 1800 seems massive on an intraday basis, it is relatively minor in the grand scheme of things. The cyan cross sectional channel is important as we cut across the larger blue channel because it defines price zones. Maintaining trade above the upper level lets you know that buyers conviction in future prospects of higher prices is strong. A failure of the upper bound of this channel is a hint that conviction is likely in the process of waning and a larger move back through the previous consolidation zone is likely underway. Since price has traversed this cyan channel area multiple times in the past it acts as a vacuum because all the levels but the most recent have been broken through and resistance to price change is weak. With that being said, it is a reasonable assumption that any sustained trade below the upper bound has a high probability of price finding the lower bound in a relatively short period of time before making its next trending longer term decision. Taking a look at the closer term picture via the cycles, we can see that the market has not decided yet which way it wants to go. 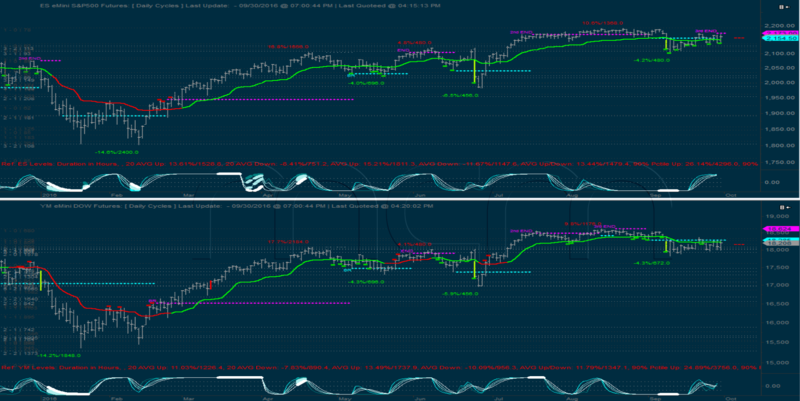 The weekly cycles show supports triggered, which have a bounce as normal expectation, while the daily cycles show broken support on ES and a fresh resistance on YM, which point down. The triggered levels on both time frames are critical to watch therefore since whichever break first will likely indicate a bigger move. The weekly show a change compared to the previous week. 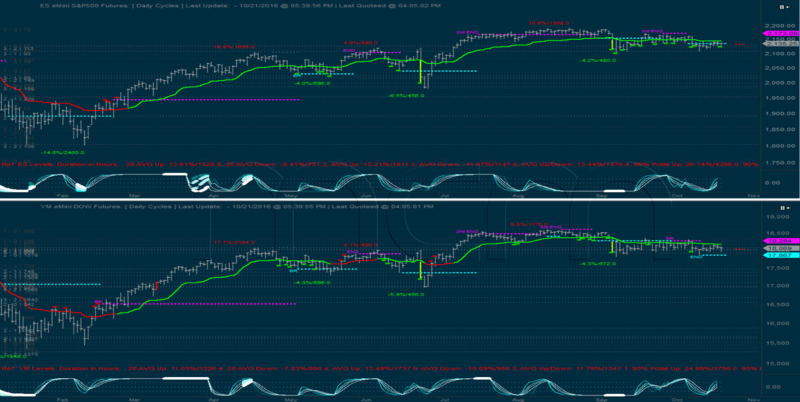 The supports which triggered on ES and YM were reset and are now triggered again. This is a very rare occurrence and it happens only when a level (support or resistance) is triggered and something changes at the end of that bar, before confirming, that makes it not confirm. This only appears when the charts are reloaded which is why it was not seen immediately. In any case, the currently triggered support levels do not change the picture. The only difference is that the support triggered by ES is higher and is a bullish retrace (BR), meaning the impulse up is still valid. Also, because it is close to the break-out level it has higher odds of holding, but the conclusion is the same: a bounce is the normal expectation. As mentioned, the daily cycles are showing exactly the opposite. ES broke it’s support level and although it didn’t break down and the impulse down wasn’t confirmed, it is a sign of weakness. YM is in a confirmed impulse down and it triggered a 2nd bearish retrace (BR) resistance level which normally would need a 2nd END support lower. More sideways action the past week, as the market didn't move much in terms o price, but was again range bound. After putting in a low on Monday, the market gaped up on Tuesday, but the up movement was short lived as the last 2 days of the week saw the market retreating again. 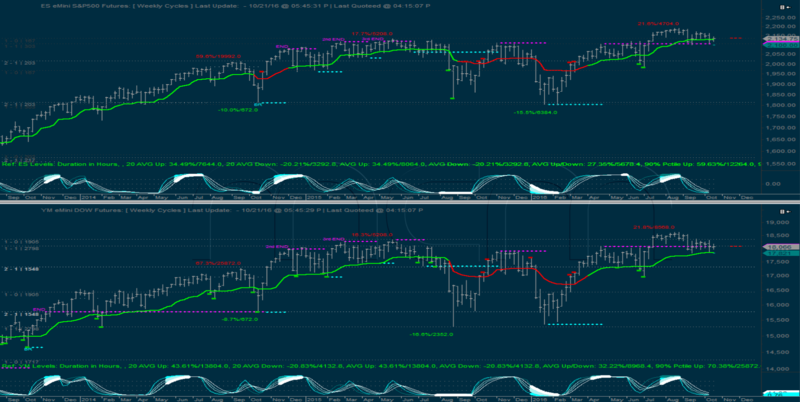 This choppy back and forth finally triggered a change in the weekly cycles - both ES and YM triggered new support levels. This fact has 2 important implications. 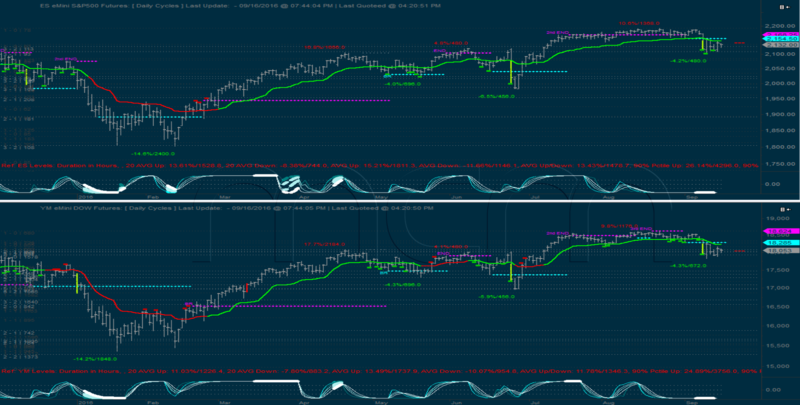 First, the previous impulse up on ES is reversed, both ES and YM being in normal oscillations now. And 2nd - the new support level is now the critical one to watch. The normal expectation is for the market to move up until a new resistance level is triggered. The directionality tool continues to move down so it will be important to watch how it acts going forward. If the market can’t bounce and the support gets broken directly, that would be very bearish. 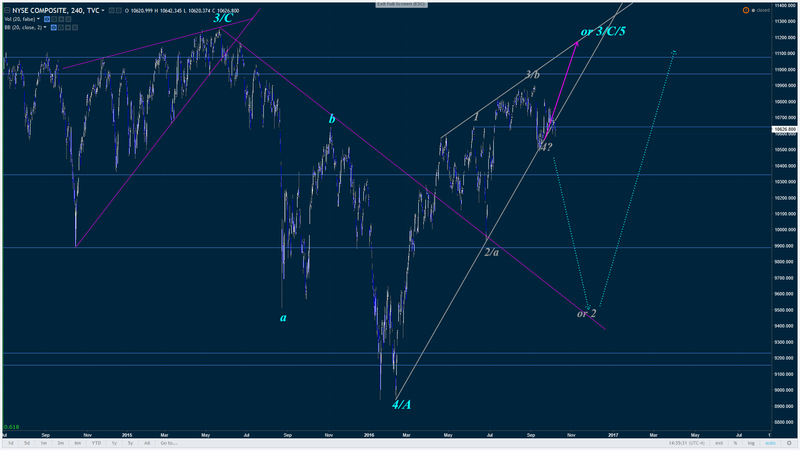 The daily cycles also have supports in place. 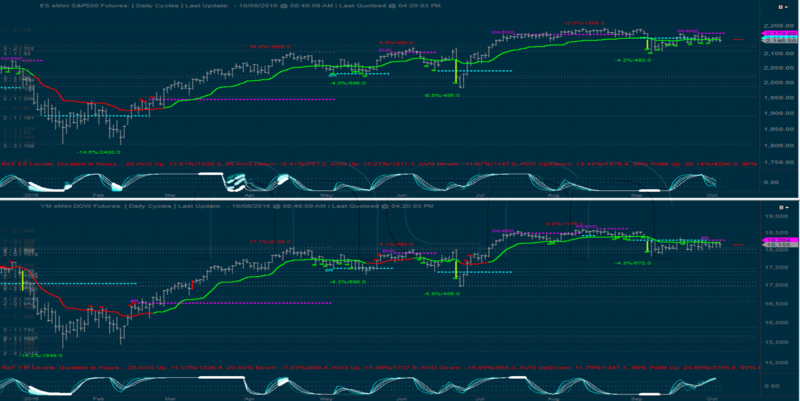 ES did whipsaw its support level, but the market didn’t break down, so a down impulse was not triggered. This also points to up movement as the normal expectation, same as the weekly cycles, and here also the directionality tool is moving up so it would be interesting to see if it continues to do that. The market continued to move sideways over the past week and despite the rather big intra-day fluctuations, remained range bound. Considering such action, it's no surprise that no real development was registered on the weekly cycles. As previously mentioned the potential of a successful back-test of the 2105 break-out level is still there, but it's not a given at this point. The directionality tool continues to head down which is another warning that the market is not decisively bullish just yet. The interesting development last week came from the daily cycles. After getting a 3rd END resistance on ES 2 weeks ago and marking the end to the up impulse, this past week YM triggered a bearish retrace (BR) of its down impulse. This BR is very close to the break-down level, which gives it higher than normal odds of holding. So the normal expectation is for some down movement, at least until the market can trigger and END support. Turning to the Elliott Wave analysis, the preferred path lows still continue to hold on the NYSE Composite. Price remained range bound for the duration of the week as buyers and sellers jockey for perceived trend direction. A new development in the chart is the exit of price from the lower bound. While this in itself is not an invalidation of the ending diagonal, it serves as a warning that buyers may not be willing to maintain the structure and a swift drop to the lower dotted cyan target path could take place. Below is a zoomed in version of the current price action and the potential near term paths that we can take. First is the dotted white path structurally known in Elliott Wave as an expanded flat where the final leg returns near the point of origin of the correction start point before continuing on the impulsive path. In this case down towards symmetry. Path number two, the solid white path is known as a bear nest where bunching in trend takes place before a full release of the potential energy in the structure is unwound. This particular structure has the potential to go far beyond the symmetry point towards lower Fibonacci targets. Lastly is the cyan option which is known as an ending diagonal in Elliott Wave, or a falling wedge in traditional technical analysis. While the paths vary greatly overall, the common theme between them is there should be at least one more low before the potential for a more sustained rally could ensue. We will monitor this chart throughout the week in the Expert Lounge to see which path is tracking the best and what the potential outcomes for that path imply. Another week comes to a close and it seems that volatility is here to stay. All trading sessions had 20+ points from low to high, while the last 2 days had even 30+. Now that's a traders dream if he can be on the right side of the trades. 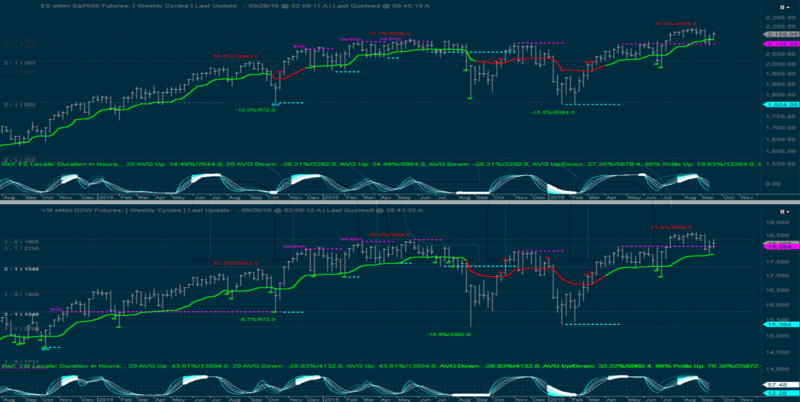 Coming back to the long term direction, last week didn't bring any significant change in the weekly cycles. The potential of a successful back-test of the 2105 break-out level is still in the cards. The market bounced from there but has yet to really take off which . YM continues to underperform and although it bounced, it barely got back above the break-out level. The directionality tool is still heading down which is also a sign that the back-test is not decided just yet. 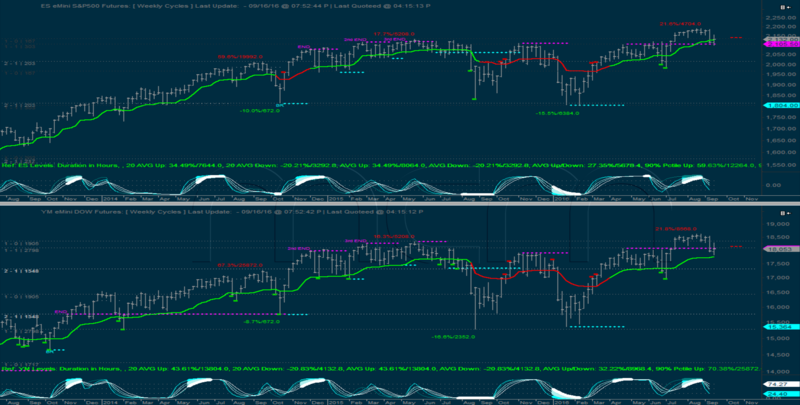 The daily cycles had an important development last week as ES finally triggered a 3rd END resistance. That signals that the up impulse is now completed. That is a very important line in the sand going forward and the normal expectation is for downside to follow. However if the market manages to break above that level, against the odds, and turn this into a nested impulse up, then that would be very bullish and would signal a lot more upside to come. While the week closed marginally higher, we still remain at a crossroads via our NYSE Elliot Wave count. The rising support is key to maintaining the structures integrity. Any sustained breach should be taken as a warning that the 'or 2' scenario could be in play in the alternated count and a dramatic decline could be just around the corner. Seasonal expectations on the week are for more weakness which would imply overall chop assuming the rising support remains intact. From everyone here at MCM we hope you all have a safe and profitable trading week. The FED week was a good omen for the bulls and the market finally managed a small break-out above the choppy range in which it was stuck for a few weeks already. 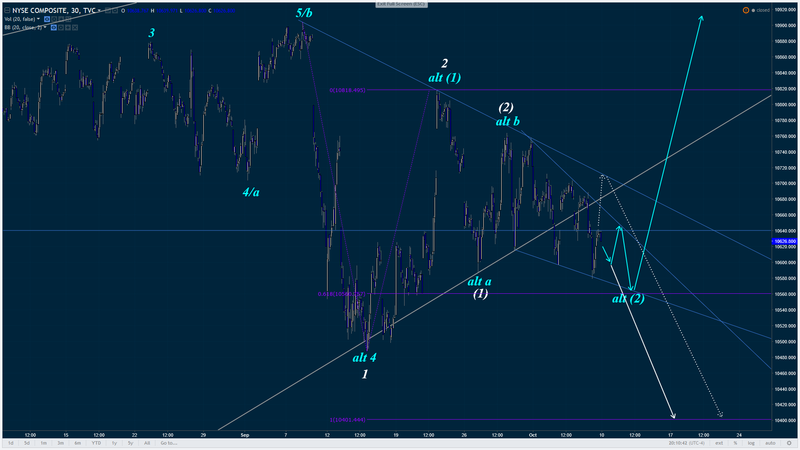 We had several short term cycles break into up impulses on mcm, which provided early clues about this ramp. Coming back to the big picture, the weekly cycles show a dangerous development for bears. The back-test of the 2105 break-out level appears to have held. The market bounced from there and if it will continue to go higher that will be a situation in which shorts would have to be patient for quite a while. YM continues to underperform, however it bounced when it met the mcm-MA and now managed to get above the broken resistance also. The bears do have one more chance and that would be to reverse this bounce rather directly. The fact that the directionality tool is still heading down is also a sign that the back-test is not decided just yet. The daily cycles are the reason why we are not fully in the bullish side just yet. They unwinded the big up impulses started back in March. YM completed that unwind (with a 3rd END resistance), while ES only had a 2nd END and could still (theoretically) get a 3rd END. In the mean time, they broke below support and actually started down impulses, although now the price came back above that support. So bears have 2 options here. One would be a direct reversal, which would mean the back-test of the previously broken support held and the down impulses are confirmed. That would be very bearish. 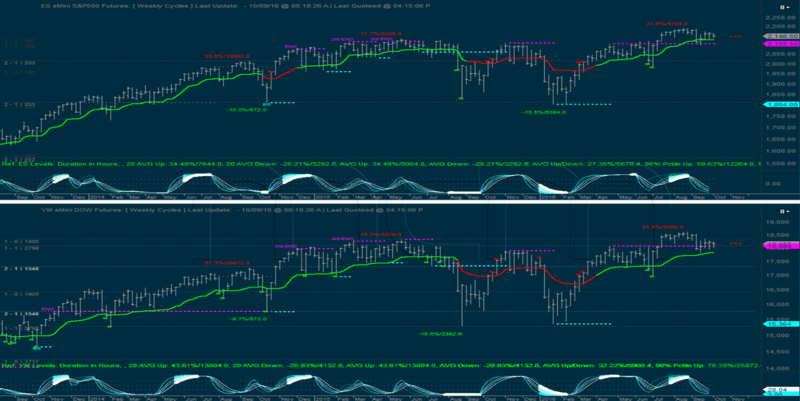 The 2nd option is for the market to go higher and reverse after ES triggers the 3rd END resistance. As we can see on YM, that 3rd END doesn’t necessarily require a lot of upside to trigger. Once that happens, reaction to that resistance will be critical. If the bullish scenario on the weekly is to be confirmed the market could break into a nested impulse on the daily. But the normal expectation is for downside from there. As always, the shorter term cycles will provide early clues into which scenario will play out. 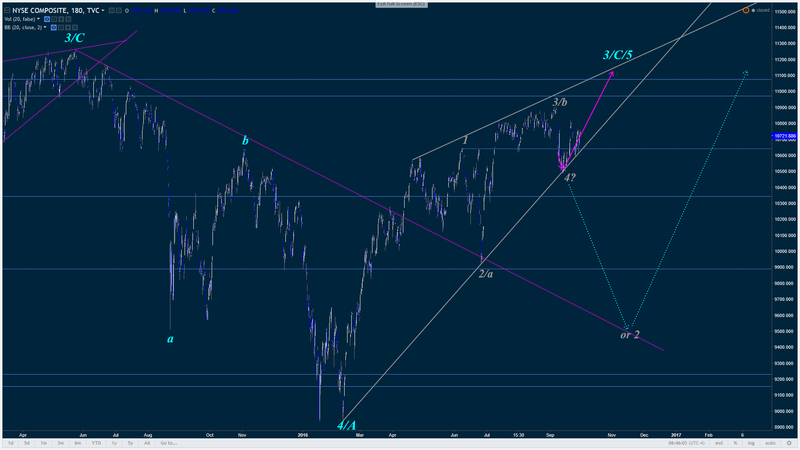 The Elliott Wave projection of the NYSE is also pointing to a crossroads with regards to market direction. With minimum expectations of the structure being met, waves one and four overlapping, the market is free to do as it sees fit from here. The duration of the fourth wave seems to be lacking taking into consideration that from a seasonal perspective, most bottoms aren't put in place till sometime on or after the second week of October. While the projected paths are very insightful as far as targets and bias is concerned, the fact that markets don't go in a straight line as the projections do makes for a challenge. Keeping that in mind, although we've bounced in what appears to be the final leg up to new all time highs, there is a very good potential this is just a counter trend move that has the potential to bottom at 'or 2' into the month of October. Best to your trading this week. The past week started just as brutal as the previous one ended. After making a new low on Monday in the overnight session, the market rallied 50+ points from that low. Luckily the mcm tools nailed that low and warned of the bounce beforehand. If you didn't have a chance to read the article detailing how that happened, you can find it here: http://mcm-ct.com/blog/anatomy-of-a-tradable-bottom/ While a valiant attempt was made to recoup some of the previous weeks losses early on this week, ultimately they failed with the NYSE closing roughly 0.75% lower than the previous weeks close. Monday's action was the highlight of the week, the rest of the trading days being more choppy, with a lot of back and forth typical for sideways action. The weekly cycles show that the back-test of the 2105 break-out level is ongoing. Market bounced from there, but it's too early to call for a successful back-test and sound the all clear for the bulls. The action in YM is also a warning sign, the price sliced directly through the break-out level and is currently in a direct overlap. The action in the next 1-2 weeks appears decisive for a resolution of the back-test and 2105 is still a very important level and worth keeping in mind. 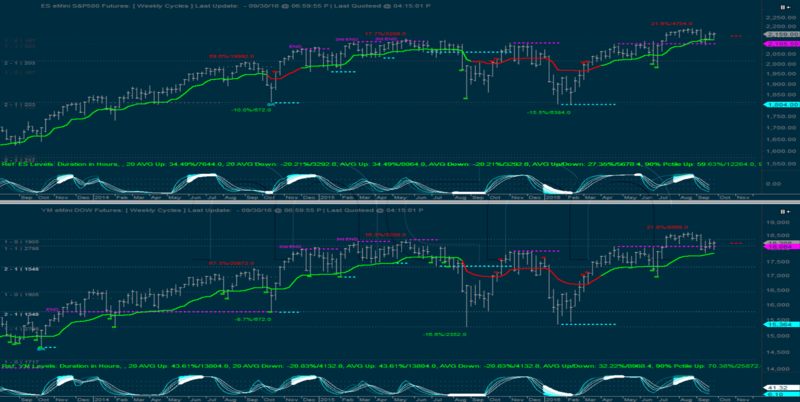 The daily cycles provided an excellent signal last week also. Namely, Monday's rally stopped almost exactly at the previously broken support sitting at 2154.5. The market retreated from there and then chopped around inconclusively. So it appears that we have what looks like 2 successful back-tests. One on the upside (on the weekly) and one on the downside (on the daily). The resolution of one or the other will paint the medium term picture. 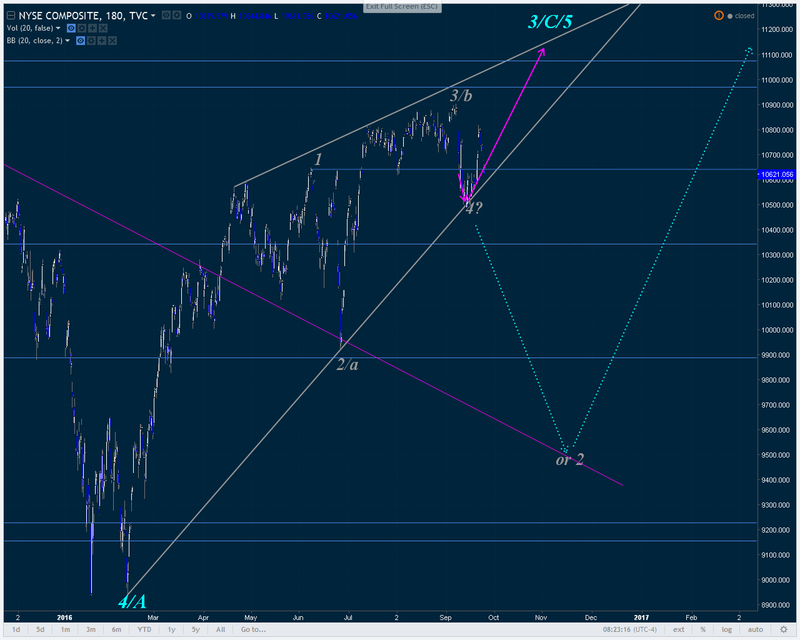 In the meantime the 2 levels are very important and critical to keep an eye on (2105 and 2154.5). The preferred path outlined in last weeks update on the NYSE tracked exceptionally well despite the massive volatility we found early on in the week. 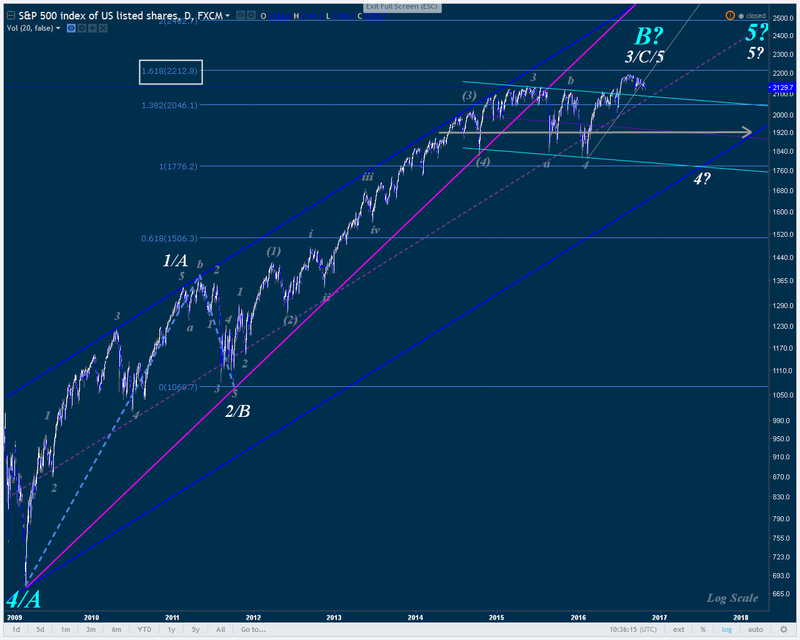 Currently we are at a crossroads as to whether we'll continue down on the path to 'or 2' or stage a rally from this general vicinity to cyan 3/C/5. In Elliott Wave there are some requirements that must be observed for the validity of a Ending Diagonal (Technical Analysis rising/declining wedge) structure. 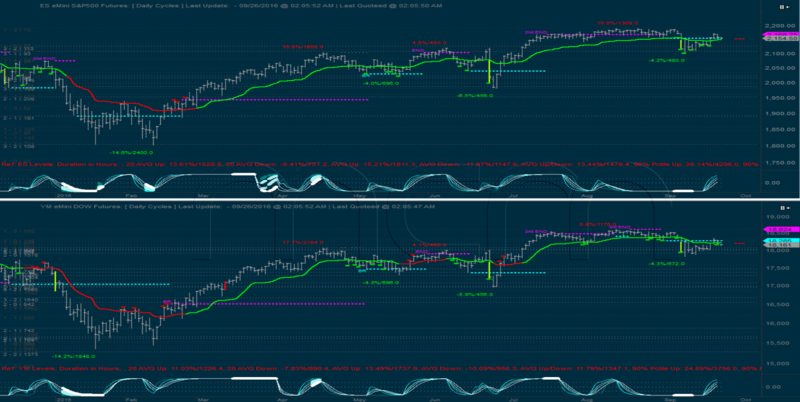 The first which was satisfied with this weeks price action with the overlap of the first and fourth waves. The second is that the fourth wave cannot be longer than the second wave. This second criteria is of great importance in this instance as it will serve as an early warning that price will have a greater probability to head to much lower levels if that criteria is broken. This week is likely to be an important one with regards to which outcome becomes the most probable. Trade safe.